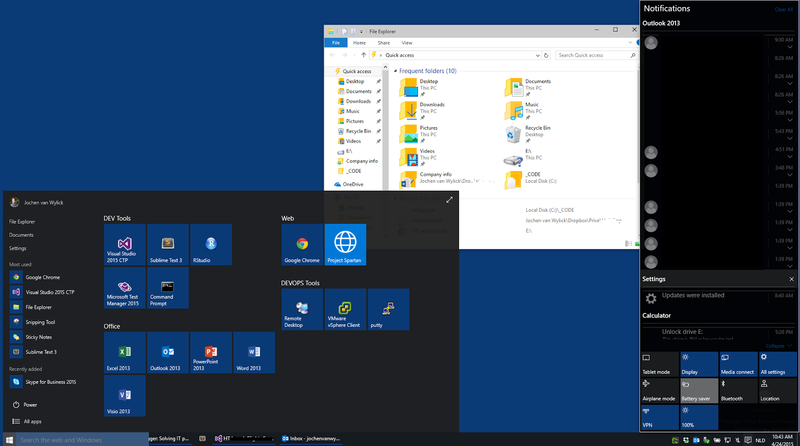 There's a new technical preview available of Windows 10 : build 10061. I decided to start running Windows 10 on my daily coding machine ( which is a MacBook Pro running BootCamp ) so I needed to upgrade the BootCamp partition to the latest windows version. Have BootCamp assistant in OS X prepare a USB stick with the latest ISO. That will put the Mac drivers on there as well. Reboot the machine - hold 'option' key and notice the following partitions: OS X partition, Windows partition and then there's two extra options ( some orange icon ): Windows Setup and EFI Boot. Pick the most right, the EFI boot. This will start the windows installer with all the drivers required to detect Mac hardware. From this point forward it's just a regular Windows installation. ... and you're done. Have fun! EDIT After installing the soundcard didn't work. The whole BootCamp driver package wasn't installed as it turned out. On the USB stick, there's a BootCamp folder though, which contains an installer which in turn will install all the BootCamp tools + drivers.